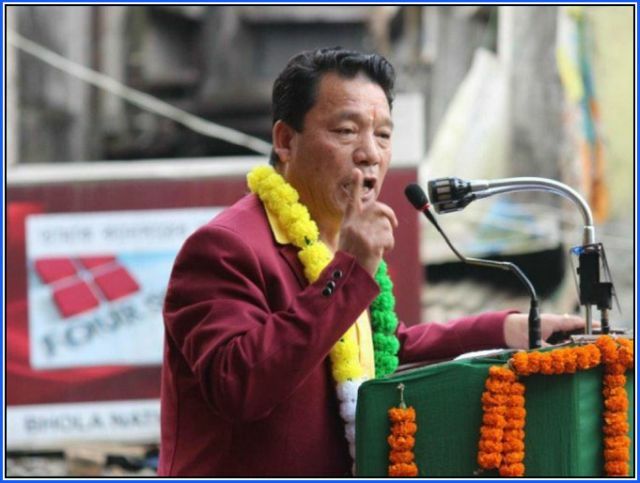 Siliguri: Bimal Gurung, the fugitive chief of the Gorkha Janmukti Morcha (GJM) faction, has urged the people to “digest the money being pumped in by Trinamool in Darjeeling Hills” but not to cast a single vote in favour of the party. Gurung, who is into hiding since mid-2017 after the police booked him for violence and bomb blasts in the Hills, has made the appeal in a video message released today. Curiously, the last time he released a video message was almost a year ago. In between, he had released several audio messages targeted at the Hills people. In today’s message shot at his undisclosed hideout, Gurung has asked the people not to compromise on the cause of the Gorkha community for the material gains being offered by Trinamool-led state government. “Take the money and digest it. But don’t give a single vote to Trinamool. Do not compromise on the pride of the (Gorkha) community,” he said in the nearly 15-minute video. Gurung has asked the all the political parties active in the Hills to get united “in the interests of the community” and to put an end to the “exploitation and tyranny” unleashed by the Trinamool government. Gurung, who is believed to be hiding in Delhi, has named GNLF, CPI-M, Congress, AIGL, JAP, and several individual political leaders of the Hills in his appeal for a united fight. The fugitive leader has accused Binay Tamang and Anit Thapa ~ the leaders of the second GJM faction~ of ruling the roost with the help of police. They are “selling out the Hills, Terai, Dooars” for individual gains, he has alleged. Gurung has also said he is exploring legal recourse to return to the Hills before Lok Sabha elections. This is even as the Bengal police have got a Look Out notice issued for him. The video message, which has been uploaded on GJM’s social media accounts today afternoon, is being viewed as a desperate attempt by Gurung to stay relevant during the coming Lok Sabha elections. Bimal Gurung, the fugitive chief of the Gorkha Janmukti Morcha (GJM) faction, has urged the people to “digest the money being pumped in by Trinamool in Darjeeling Hills” but not to cast a single vote in favour of the party.